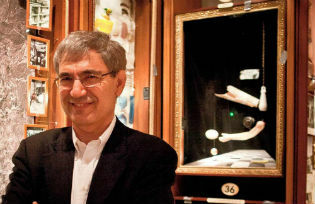 Turkish author Orhan Pamuk elucidates the inspiration behind his "Museum of Innocence" which started life as a novel and then became a museum in Istanbul. In a famous article in the “Paris Review”, Hemingway made a list of the literary figures who had influenced him or taught him something important. Around the time, aged twenty-three, when I decided to give up painting and become an author, I was enthralled to read Hemingway’s list and see musicians like Bach and Mozart and artists like Brueghel and Cézanne listed beside writers such as Flaubert, Stendhal, Tolstoy and Dostoyevsky. In the future, one day, I was determined to make the same sort of list. Thirty five years later, upon finishing The Museum of Innocence, I decided that the time was right. Of all the books I had written, this novel led most clearly to questions such as: “When did this idea first come to you?”, “What inspired you to write this novel?”, “How did you come up with this?”, and so on. 1. At a family get-together in 1982, I met Prince Ali Vâsıb Efendi. As the youngest grandson of Sultan Murat V, he would have been on the throne at that time if the sultanate had continued and the Ottoman dynasty remained in power in Turkey. But this old man, by now in his eighties, who had only recently been allowed to return to Turkey, wanted neither political power nor a throne. He just wanted to be able to stay permanently in Turkey, which he was able to visit only on a foreign passport. He lived in Alexandria, spending his summers in Portugal, and whiled away his time with friends who were also retired or ousted European and Middle Eastern princes and monarchs. (He even told me the real reason why the Iranian Shah Reza Pahlavi had split from his first wife Fawzia). As you can tell from his posthumous memoirs, as prepared by his son Osman Osmanoğlu and published in 2004 as Memoirs of a Prince: What I Saw and Heard of a Land and its Interests, he was troubled by financial difficulties throughout his life. At my curious questioning at the family dinner table, he told me how King Farouk had been a kleptomaniac: when the King visited the museum, he had simply opened up a case containing an antique plate that had taken his fancy and, without seeking permission, taken it back with him to the palace. Now the prince had returned to Turkey after his fifty years of exile, he was looking for work so as to earn enough money to settle permanently, and told us that, sadly, no-one had yet helped him with this. Someone at the table suggested that maybe he could find work as a museum guide at the Ilhamur Palace where he had spent his childhood. Since he had known the life of the palace intimately before it became a museum and had a background in palace museum management, wouldn’t this be a wonderful solution to his problems? That was how I first understood the joy of a man being both a museum guide and at the same time an exhibit, and the excitement to be gained from explaining one’s life to others in a museum years later, surrounded by all one’s things. These lines are themselves an allusion to the way a creative writer takes inspiration and sources from another place… Nabokov’s novel is written in two parts. First we read a long poem about the life and world of a poet similar to Robert Frost, or John Shade. The real body of the work is comprised of the strange commentary on the poem made line by line by one of his contemporaries, who, as we read, we begin to learn is a little unhinged. This strange contemporary is named Kinbote, and taking these words and lines as his starting point he begins to explain his own life, full of kings, palaces, coups and murders. It must have been through this novel, created through notes written line by line about a poem, that I conceived the idea of writing a novel through the notes written under each exhibit at a museum. My novel, in the early years, was in the form of a museum catalogue with commentary. Just like a museum catalogue, first it would introduce each exhibit, e.g. an earring or famous Jenny Colon branded bag, to the museum visitor, and then I would go into the feelings that the exhibit awakened in our hero. After writing the novel in this way for many years, a love story stormed in, and with it a frenzy of reordering notes, memories and museum exhibits to bring love to the forefront. Let me add this with a wink for those who read the book for its love story: up until that time I wasn’t aware of the unexpected power love would bring! However, I didn’t bring up Pushkin’s poetic novel, filled from start to finish with literary references, for its treatment of love, but because Nabokov prepared a translation in which he noted these references line by line. The detailed, comment-filled notes Nabokov made over years on his Pushkin translation take their place next to Pale Fire. I enjoyed opening my thick volume of these notes at random and reading them at random even more than the poetry itself. 4. In the novel, while we’re on the topic, yet switching seamlessly to another, we have come to the art of removing the difference between important and unimportant details and to represent peripheral details as if they were very important indeed. In Sterne, Flaubert, Nabokov, Alain Robbe-Grillet and George Perec, (especially in his immensely enjoyable Life: A User’s Manual), the art of going off-topic and showing the objects in the periphery comes to feel like the essence of a serious novel that is asking new questions. After Perec’s love of list-making and the inventories of possessions in Balzac-style novels, now the centre of all these possessions, our lives and, more importantly, our spiritual world has begun to be presented to us like poetry; We develop a strong, personal and emotional relationship with many different possessions throughout our lives in a way that brings to mind the refined Marxist concept of ‘alienation’, but must we be in love with the hero of my book, Kemal, who reminds us of this? 5. The relationship between poetry and possessions: the still-life paintings of the Dutch masters symbolised poetically the ephemeral nature of life using skulls, watches and melted candles, and I am very fond of these paintings in the vanitas style, the still-life paintings of the greatest of the 18th century French painters, Chardin and Cézanne, as well as Balthus, Duchamp and the man who knew how to extract the secret poetry from the names of hotels, Joseph Cornell. 6. To those readers who ask “Mr. Pamuk, let’s not beat around the bush, have you also fallen in love and begun collecting the possessions of your old flame, just like the hero of your book?” I want to show to what extent my book drew upon real life: my aunt’s family had a ‘56 Chevrolet, its driver’s name was Çetin; the Aygaz headquarters where my father worked for years were in Harbiye, right opposite the statue of Atatürk at the entrance to the military base, that is, right where Satsat is; on New Year’s Eves my grandmother would get together all the children and in-laws for a meal at the Pamuk Apartments, and we grandchildren would play tombola: she would have selected the prizes months earlier and be ready with them. From the 1950s to the 1970s many houses and shops in Istanbul had a canary in a cage or a fish tank, but after television broadcasts began to gain popularity, they disappeared. This new state of affairs taught us that our relationship with these animals had been nothing more than the desire for something to amuse our eyes; in 1983, when I’d married and needed a bit of money, I started to turn my first novel Cevdet Bey and His Sons into a film script at the urging of a director who had enjoyed it, but the shooting was never completed. At around this time a stage manager friend of mine took me around the bars frequented by the cinema crowd in Beyoğlu. When he saw that I got drunk straight away from the strength of the gossip I heard through the noise of actresses and from just two glasses of beer he laughed at me, and lovingly poked fun; I smoked an average of thirty cigarettes a day from 1974, when I gave up painting and studying architecture, to 1995, and it was in 1995 I first gave up smoking. To me, the true meaning of the phrase Westerners use, “to smoke like a Turk”, was not the consumption of too much tobacco or being under a cloud of smoke, but was referring to some of the special social gestures and individual comments that could be made when opening your cigarette packet and proffering a cigarette to someone you’d just met or hadn’t met at all in a gesture of friendship and peace, while rolling the cigarette around in your fingers until it was ready to smoke, and while holding it between your fingers or practicing the hundreds of different ways of blowing out your smoke (and to know and recognise these, too). Similarly, an open-air cinema did visit the small town and holiday village on the shores of the Marmara that I described in Silent House in the late 1960s, and we watched Turkish films through a strong smell of manure and the lowing of cattle from the barn next door. I remember well in the early 1970s, in the famous Garden of the Hunchback in Beşiktaş, watching films together with my friends from university and thousands of sunflower-seed munching others. In the early 1960s, my mother decided to get a driving licence, and she took lessons, bringing my brother and me along to save us from the boredom of the hot summer days at home; from the back seat we would either laugh or get a scare when the car shook itself to a stop. Ten years later, aged eighteen, I decided I would also get a license, but after failing the driving test countless times, I finally sympathised with my mother’s travails. Some of the rich people I depict in my novel are inspired by my father or uncle’s friends, others by my cousins and their friends, and the rest by my own high school friends. To explain how far the ‘luxury’ restaurants, the Bosphorus meyhanes, the Istanbul streets and many of the shops in my book have been fed from my own experience, or to try to tell of how much Istanbul has contributed to my books would be an endless task. And so it is that I write this piece, remembering all the good times from the decade in which I conceived and the six years in which I wrote the book. 7. Between the years 1996 and 2000, I took my daughter to school in the mornings. After leaving her at the school gate behind Tophane (300 metres from the Keskin family home) I would wander the back streets of Çukurcuma, Firuzağa and Cihangir in Beyoğlu to my office thinking about what I would write that day (My Name is Red, Snow). Sometimes I felt that the timeless air of these streets and their people would never be lost. The things I saw on the streets, for example the fresh bread and simit in the baker’s window, the vintage painkiller poster in the chemist’s shop that showed a person’s internal organs, or the huge jars filled with many-coloured pickles in the window of the pickler’s shop, gave me such intense pleasure that I wanted to own those views, to frame them and watch them, in order to be sure I would never lose them. The humble flea-markets in the streets of Çukurcuma, shops selling bric-a-brac from old tables to ashtrays, from cutlery to the locally made toys of my childhood and places selling old magazines, books, maps and photographs all stoked up a desire in me to somehow put what I saw in a frame and preserve these things forever. So at that time I thought of buying small things from these shops and making a house-museum. I spent a long time wandering the streets, looking for an old house for sale to turn into a museum. 8. Later, when I bought a house that could be turned into a museum, my internal collector came out. But I knew I wasn’t a true collector. I didn’t buy the old salt-shaker, cigarette holder, taximeter from an old taxi or cologne bottle I saw in a shop window in order to make a collection, I bought them in order to make them a part of my novel. Sometimes I would get excited and buy something I had never even thought of in a shop window and bring it home. The world was on friendly terms with my novel and the exhibits for my museum. My enthusiasm wasn’t that of a collector, someone who is trying to collect a whole series, but instead the excitement of a designer, making each piece part of a novel and a museum: that was the vision that circled in my head. I loved these possessions, like many things in my life, because they could become part of a story or part of a book. Sometimes this was a success: I would place the item in front of me, and I would tell a piece of my story, just like Flaubert in his ‘master of realism’ poise. Most of the time I used to talk a little about the items and then, to protect my novel from a deceptive truth, I would stop myself from going too far. Sometimes I would put old things I already knew into the story. I gave my father’s old ties to Kemal’s father and my mother’s knitting needles to Füsun’s mother, because I liked the idea of giving my heroes things from my life and my own family. Just as, in the novel, the rich part of the family gives its used goods and old dresses to their distant relatives on the poor side, I gave things that I knew from my life, and found old things that had left an impression on me to give to the heroes in my novel. Sometimes the item had left its mark on my childhood: for example, the yellow jug that my aunt used for years at her dinner table, and I would place it on the table belonging to my heroes in the book without adding it to the museum collection. (Later, when my much-loved Aunt Türkan passed away, that jug did not pass into my hands. Hopefully my cousin Mehmet will read this and donate it). After my novel was finished and published, I found a box while cleaning out my office; it contained many old things I had bought from antiques shops to add to the book but had forgotten. Looking at them all, including a worldly-wise bell from the door of a well-off household and the still-working rusted headlamp from an old horse cart from the Princes Islands, I felt like writing a completely new novel using these items. 9. I had discovered the ability to conjure up a story or a novel by just looking at a series of objects long before I turned it into a habit with The Museum of Innocence. Russian formalist and literary theoretician Viktor Shklovsky said that what we call a plot was a line passing through all the points we want to make and themes we want to discover in a novel. On selecting a series of things by instinct, to make them all into a story and imagine how they might have fit into the lives of the heroes, we have already begun to start a novel. After Dostoyevsky’s Crime and Punishment and the tales of Edgar Allen Poe, as well as detective novels, which have had their permanent influence on the modern novel, the heroic Mr. Detective uses a series of clues in order to imagine the full story. 10. But in order to build a plot and whisk the reader into a consistent, rich and human world inside a novel, we need to create an emotional linkage to the things we have collected. Thus we can only dream up a novel by juxtaposing items that awaken an emotional and poetic response in us. Prince Ali Vâsıb Efendi could have really been a museum attendant or a museum guide in the Ilhamur Palace, talking emotionally about the rooms where he spent his childhood and youth and all the things there. But it is to imagine what he would say, having finally returned half a century later, at death’s door and aware of his whole life and its meaning, while looking at each item, every mirror and every lamp in the rooms in of the palace where he had spent his childhood. 11. The first person who used the emotional relationship we have with things in a museum context was the 1930-born Romanian-origin Swiss artist Daniel Spoerri. He would create a work of art from a messy dinner table with plates and glasses from a half-eaten dinner, and he became famous for capturing the chaotic beauty of a dinner table in pictorial form. In 1979, in Cologne, Germany, he created an exhibition of ordinary items from daily life, and called it a “Museum of Feelings”. This temporary exhibition carried the spirit of Perec’s similar fever to write poems about ordinary items from daily life and that of the Dadaist Fluxus movement, which wished to unite literature, music and art through the use of ordinary items. 12. Spoerri said that one of his sources of inspiration for his Museum of Feelings in Cologne was the Frederic Marès Museum in Barcelona. This museum’s “top floor of hairclips, earrings, playing cards, keys, fans, perfume bottles, handkerchiefs, brooches, necklaces, bags and bracelets” was visited first by the hero of my novel, Kemal Basmacı, and later many times by me. Just as both my novel and my museum were deeply influenced by Proust, Joseph Cornell, Tolstoy, Nabokov, Borges and the Bagatti Valsecchi Museum in Milan, I must use this occasion to thank and honour Frederic Marès. To the curious reader who will still ask “Mr. Pamuk, don’t you also look at your lover’s things for consolation? Are you Kemal?” I now have a confession to make: I am not Kemal, I am Monsieur Flaubert. Orhan Pamuk is a Turkish novelist, screenwriter, academic and recipient of the 2006 Nobel Prize in Literature. Born in Istanbul, he studied architecture and journalism, but at the age of 23 he decided to become a novelist. He was a visiting scholar at Columbia University in New York from 1985 to 1988. In New York he wrote his most of his novel The Black Book (first English ed., Carcanet Press Limited, Manchester 1990), which enlarged his fame both in Turkey and internationally as an author at once popular and experimental. He is the recipient of numerous other literary awards. My Name Is Red (first English ed., Alfred A. Knopf, New York 2001) won the 2002 Prix du Meilleur Livre Étranger, 2002 Premio Grinzane Cavour and 2003 International IMPAC Dublin Literary Award. In 2014 The Museum of Innocence (first English ed., Alfred A. Knopf, New York 2009) received the European Museum of the Year Award. The European Writers’ Parliament came about as a result of a joint proposal by Orhan Pamuk and José Saramago. His most recent book is Kafamda Bir Tuhaflık (Yapı Kredi Publications, Istanbul 2014).